Asociación Española de Derecho del Trabajo y de la Seguridad Social (AEDTSS), are organizing a Mediterranean Congress of Labour Law, taking place on May 14-15 in Lisbon, Portugal. For more information, please see the final program posted below in PDF format, or visit the APODIT website. 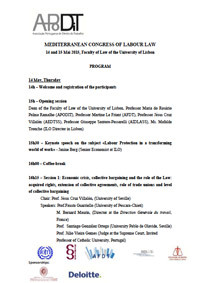 Posted in Mediterranean Congress of Labour Law, Other Events on March 11, 2015 . Website designed and maintained by Lancaster House.